Arsenal thrash Watford to stay in hunt for the title. Mesut Ozil starts the move with a stunning, long-range ball to Joel Campbell, who skins Allan Nyom before picking out Theo Walcott. The England international can't miss from two yards out and those Arsenal fans who left early missed a goal. Serves them right. Two minutes left. Come on ref, no added time please. The Watford fans want to get out and make the 18 mile trip home. Arsenal man Mohamed Elneny picks up a booking for bringing down Nordin Amrabat. Algerian Adlene Guedioura's low free-kick goes wide. A shoutout to north Africa in that passage of play. Nordin Amrabat looks threatening for Watford here. He picks the ball up on the half way line and charges towards the Arsenal goal. The home defenders look frightened, they're back tracking. What can the Moroccan do here? Is he going to shoot? Nope - he tries to lay off a pass to team-mate Ikechi Anya, but succeeds in playing the ball out of play. That was terrible. Alexis Sanchez off, Joel Campbell on. Can't begin to tell you how rubbish Watford have been today. How can we explain it? Players haven't been together for two weeks because of the international break, but surely they can't have forgotten how to play with each other in that time? It's just as well there are three poorer sides in the Premier League than Watford because it's relegation form from them at the moment. This will make it two wins in their last 13 league games. Are Watford about to get a consolation goal? Yes Alexi Iwobi, you deserve this standing ovation young man. A superb performance capped off by a goal. The Nigerian comes off and Theo Walcott enters the fray. Minutes after coming on, Arsenal striker Olivier Giroud heads straight at Heurelho Gomes from a corner. David Ospina has had nothing to do all game, but pulls off a brilliant save from Troy Deeney's curler, lunging to his left to keep out an almost certain goal. Top stuff from the Colombian. Watford's final change sees Adlene Guedioura come on for Almen Abdi. Danny Welbeck gets a deserved rest for Arsenal as Olivier Giroud comes on in his place. A long 25 minutes for Watford to endure. They know this game is already over and it's petering out into a testimonial-paced encounter. Allan Nyom, full of frustration, chops down Mesut Ozil. The German was rather asking for that, standing on the ball with one foot, and the Watford man took his opportunity to swipe him. It earns Nyom a deserved yellow card. Arsenal are enjoying themselves now and playing with such freedom. All the big guns - including Danny Welbeck, Mesut Ozil and Alexis Sanchez - are involved in a move that leads to a corner, but Watford are able to clear. 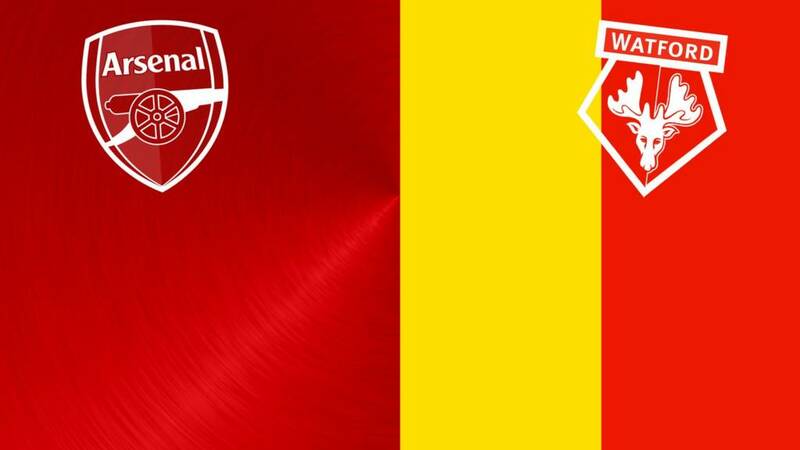 Watford earn a free-kick deep in the Arsenal half and almost get back into the game. Ben Watson's deep free-kick is guided back into the danger area by captain Troy Deeney and Sebastian Prodl's goal-bound header is cleared off the line by full-back Nacho Monreal. Right place at the right time. "The more I see of Sanchez and Iwobi the more I like the combination. It's been their show today, and Iwobi has just hit the bar. "Iwobi has that little ingredient you need at this level and he's very exciting. "Arsenal are showing the form we've expecting them to show and they've lacked. Listen, if they win all their remaining games this season they'll win the title." Arsenal teasing and torturing Watford, spraying the ball around while sending men forward. The Hornets have goalkeeper Heurelho Gomes to thank for it being only 3-0, as he saves from Mesut Ozil and Alexis Sanchez in quick succession. Oh, so easy for Arsenal to go forward and find space in the opposition box. Alex Iwobi almost has his second, turning a Watford man inside out before lashing a left-footed shot against the crossbar.